1 of 4 Kagurazaka Street stage O-edo Tour, 12 -13 November 2016. A programme of shop strolling, live and street performances, story-telling, traditional Japanese parlour games and evening live music. Photo © 渡部晋也. Courtesy of Tokyo Metropolitan Government. Kagurazaka Street stage O-edo Tour, 12 -13 November 2016. A programme of shop strolling, live and street performances, story-telling, traditional Japanese parlour games and evening live music. Photo © 渡部晋也. Courtesy of Tokyo Metropolitan Government. 2 of 4 Kagurazaka Street stage O-edo Tour, 12 -13 November 2016. Photo © 渡部晋也. Courtesy of Tokyo Metropolitan Government. Photo © 渡部晋也. Courtesy of Tokyo Metropolitan Government. 3 of 4 Kagurazaka Street stage O-edo Tour, 12 -13 November 2016. Photo © ARCSHIP_大谷. Courtesy of Tokyo Metropolitan Government. Photo © ARCSHIP_大谷. Courtesy of Tokyo Metropolitan Government. 4 of 4 Kagurazaka Street stage O-edo Tour, 12 -13 November 2016. Photo © 渡部晋也. Courtesy of Tokyo Metropolitan Government. In recent years, Japan’s traditional art forms have become less and less popular due to demographic and lifestyle changes, particularly in urban areas. Despite various governmental and educational programmes intended to tackle this problem, it is becoming more serious than ever. The loss of traditional art forms and the space for their performance threatens a loss of Japanese cultural identity. Kagurazaka, a Tokyo neighbourhood, is a centre for traditional Japanese music, Noh, and comedic storytelling and those who study them. It is also one of Tokyo’s historic ‘pleasure quarters,’ with a large concentration of geisha houses. However, most of these cultural activities are traditionally supported by individual patronage. Due to changing lifestyles, the collapse of the bubble economy in the early 1990’s, and the financial crisis of 2008, there are only a few active patrons left. This decreasing audience is putting Japanese culture under threat. 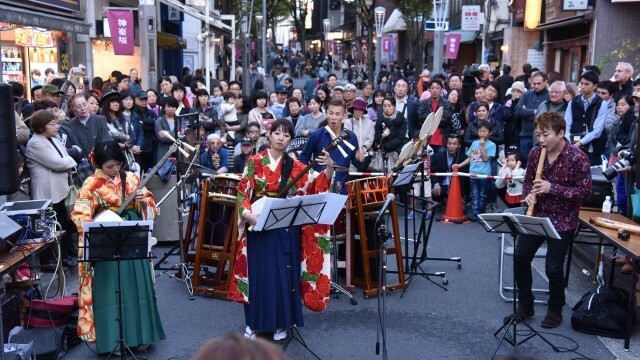 As rents increase and more businesses open in Kagurazaka, there has been a decrease in the number of practice rooms available for traditional Japanese music. 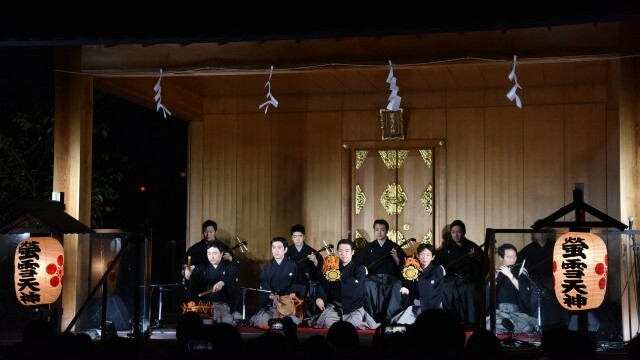 As a result, members of the public are usually only able to encounter the traditional arts at temples, shrines and in public cultural venues that function as centres of the community. Although local non-profit organisations were running events to support and promote the traditional arts, they had chosen to retain independence by not seeking sponsorship from businesses. This meant very small-scale events which were less influential due to limited funding. Kagurazaka Street Stage O-edo Tour began in 2013 as a festival bringing the town and people together, and is now entering its fourth year. It is intended to showcase and popularise Japanese traditional arts, introducing them to a wide range of people – including the younger generation and overseas visitors – in an easy-to-understand and enjoyable way. 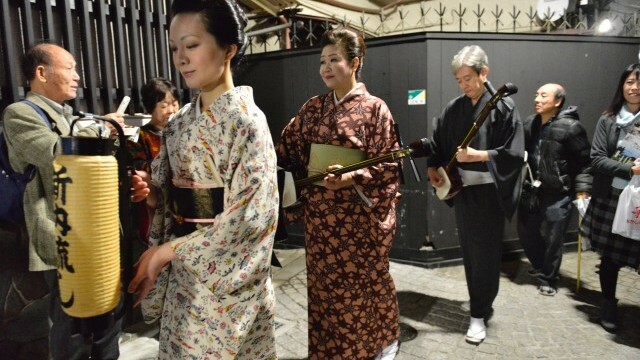 It brings people into contact with the traditional arts using a range of events including shop strolling, live performance, street performance, story-telling, and traditional Japanese parlour games. Encourage those who are not familiar with traditional art to come into contact with it, and increase their awareness of it. Encourage them to view it not as special or difficult to understand, but as casual and accessible. Play an important role in the invigoration of the Kagurazaka community, with the aim of becoming a model for public cultural projects developed around a regional partnership. Kagurazaka Street Stage O-edo Tour makes use of the walkable, human scale of Kagurazaka. Both the rich history of the area as the centre of the traditional Japanese arts and financial support from the Tokyo Metropolitan Government have made possible to realise such a large scale project. In 2016, about 38,000 people joined in the festival. Running the festival was a challenge at first, because none of the main agencies had run such a large-scale event before – nor did they have experience collaborating with other organisations. Another challenge was audience engagement. As the festival has developed, artists have gradually learned how to express themselves in ways that the audience will enjoy and find interesting. The festival has helped to strengthen awareness of the traditional arts in the local community, drawing support and cooperation from the local merchants association, temples, shrines, shops, local residents and others. It has also raised visitors’ awareness of Kagurazaka. Interest in the festival has increased significantly since it started. By creating opportunities for engagement, the festival is giving its audiences a basic knowledge of the Japanese traditional arts. The next step of the project is to create a virtuous circle: through familiarising audience members, they become inheritors of the Japanese traditional arts, and participate in helping to revive the field. Kagurazaka Street Stage O-edo Tour has become a model for other cultural festivals - for example, Tama Traditional Culture Festival 2016. The 2020 Tokyo Olympic Games may provide further impetus for the promotion of traditional arts and culture, and this project can provide a useful case study for other cities and neighbourhoods. In order to successfully implement a public engagement programme such as this, it is essential to understand the characteristics and context of the area, as well as understanding the venues and performers involved. Despite its success and growing popularity, the project is still run on a very small budget. Local residents have lent equipment, artists take only a small stipend for their work, and over 100 volunteers contribute their labour to put on the festival. It would be impossible to run the festival purely based on the financial support from Tokyo Metropolitan Government. If the budget could be increased, the project would be even more successful.